In this scene, King Bahram Gur has won the hand of seven beautiful princesses from seven distinct lands. They each entertain the great king on successive days, ensconced in different pavilions, dressed in different colors, all with different lessons for the king. 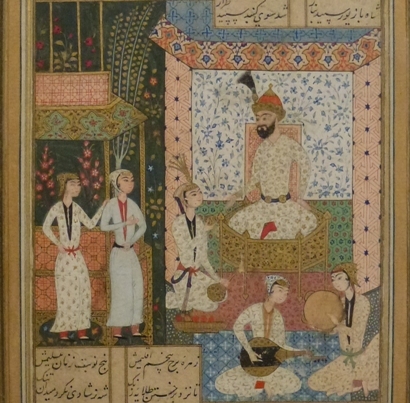 Depicted here, after spending a day with each of his other six consorts, Bahram Gur visits Diroste, the daughter of a Persian king and mistress of the White Pavilion on Friday, the final day of the week. Teaching the king perhaps his most important lessons, Diroste tells of the attraction of passion, and the redemption of virtue. The 12th-century poet Nizami is famous for setting down in writing the great folk histories of Persia. This scene is drawn from the Haft Paykar (“Seven Beauties”), one of the sections of Nizami’s Khamsa (“Quintet”). The Haft Paykar records the rise to power of the Sasanian king Bahram Gur, while also serving as a fable of love and morality. Bahram Gur in the White Pavilion (detail), mid-16th century, Persian (modern Iran), Safavid period (1501–1722), opaque watercolor, ink and gold on paper, 9 3/16 x 5 7/16 in., Eugene Fuller Memorial Collection, 47.16, Photo: Marta Pinto-Llorca. Currently on view in the Ancient Mediterranean and Islamic art galleries, fourth floor, SAM downtown.